It was found possible to bring pairs of freely moving drops into collision under controlled conditions with an apparatus which utilized converging streams of drops that were uniform in size and spacing. The results of the investigation conducted with this apparatus make possible a number of conclusions about the behavior of uncharged water drops 100 to 1000 microns in diameter colliding in a gaseous atmosphere. 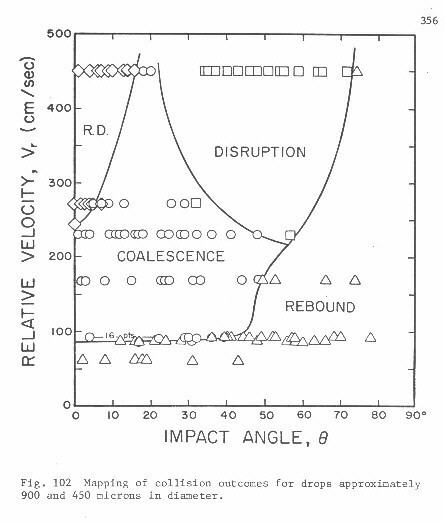 The four major factors which determine the outcomes of such collisions are the relative velocity, impact angle, size and ratio of diameters of each pair of colliding drops. At least six different outcomes are possible as indicated in Figure 106 and recorded in the composite photographs of Chapter VIII. 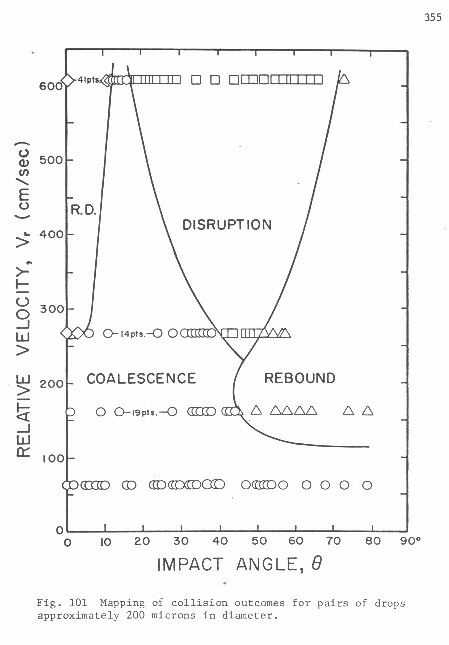 The major-factor conditions which yielded five of these outcomes are indicated by the separate mappings shown in Figures 100 to 105 and the combined mapping shown in Figure 108.
coalescence will occur in the central region for a range of relative velocities and disruption will occur in indirect collisions at relative velocities above a certain onset value regardless of changes in aero dynamic and other minor factors. At relative velocities well above those for the onset of reflex disjection and disruption a sizable central region for the former outcome and a larger region for the latter will limit stable coalescence to a small intermediate region. 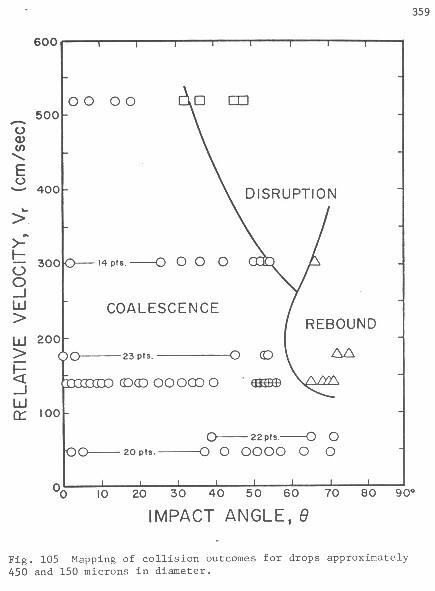 Sufficiently high relative velocities can be expected to eliminate all coalescence. No quantitative data on the conditions needed for a fifth outcome, spatter, were obtained in the present investigation. However, the results of other investigators suggest that this outcome can be expected to appear at Weber numbers above about 200 and perhaps at somewhat lower values as well. 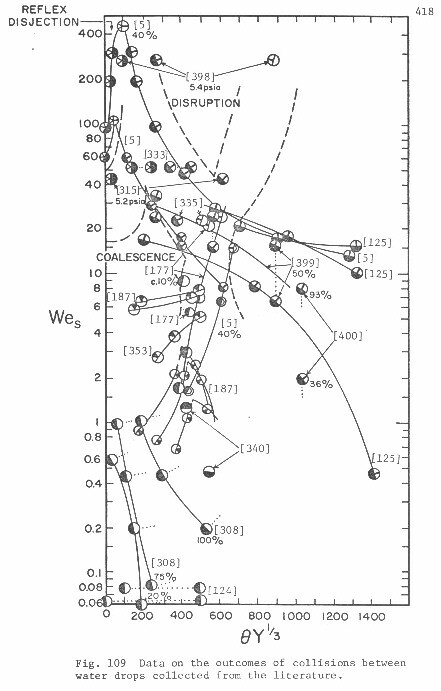 Equally sized drops and unequally sized small drops were found to coalesce in the central region at even the lowest Weber numbers while unequally sized large drops displayed a strong tendency to rebound in both direct and indirect collisions at Weber numbers below about 3. 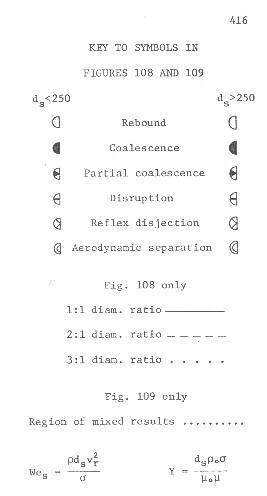 Partial coalescence was also found to be possible at scattered conditions below Wes= 5 when the colliding drops differed sufficiently in size. This outcome appeared to be impossible when the ratio of the drops' diameters did not exceed 2:1. A charge difference on the order of l0-13 coulombs was found to induce 100 percent partial coalescence in low-velocity collisions between dissimilarly sized large drops which experienced rebound when they were uncharged. 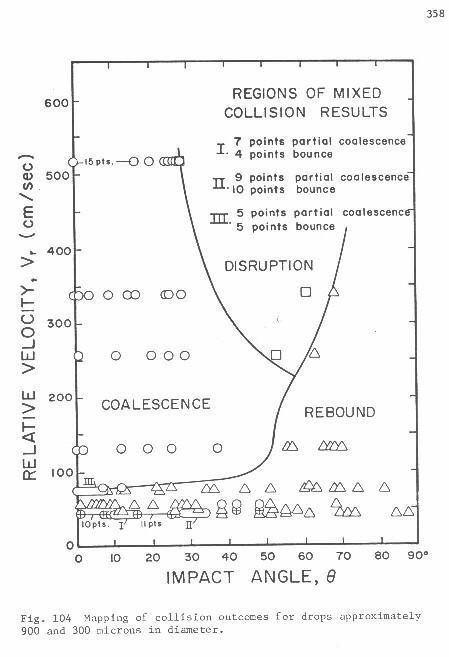 At Weber numbers above 5 an increase in the diameter ratio or a decrease in the size of a colliding pair of drops causes coalescence to occur under a wider range of conditions. Both of these changes caused an expansion of the central coalescence region mapped in plots of relative velocity versus impact angle in the present study. A decrease in drop size also promotes coalescence at Weber numbers below 5. 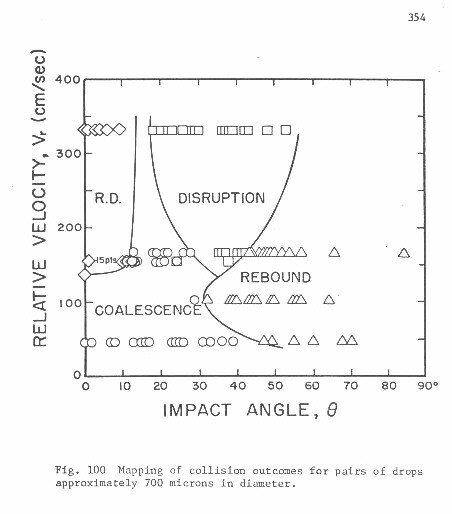 All recorded collisions between small drops at relative velocities below 100 cm/sec resulted in coalescence regardless of the impact angles. It can be expected that virtually all collisions in a humid atmosphere between pairs of water drops with an average diameter of 300 microns or less will result in coalescence when the relative velocities are below 100 cm/sec. 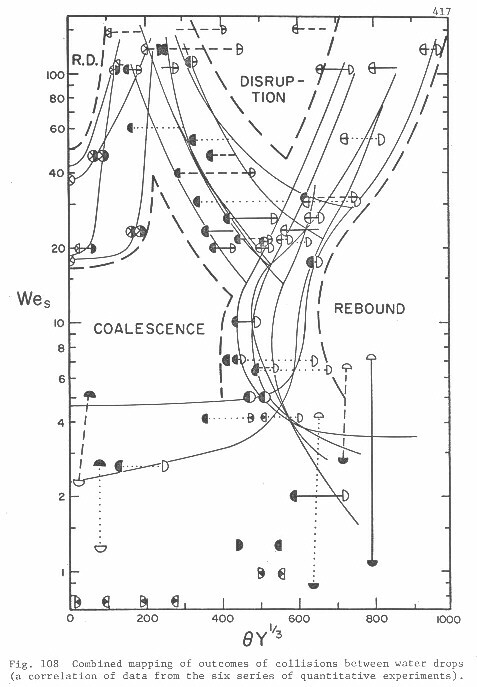 However partial coalescence may also be possible if the colliding drops have a sufficiently large diameter ratio. An increase in the diameter ratio is expected to promote partial coalescence by producing a more rapid drainage of the smaller drop into the larger one. This increases both the momentum imparted to the expelled liquid and the reaction to the expulsion. The result is thought to be a lengthening of the cylindrical remnant of the smaller drop from which the secondary drop must be formed. 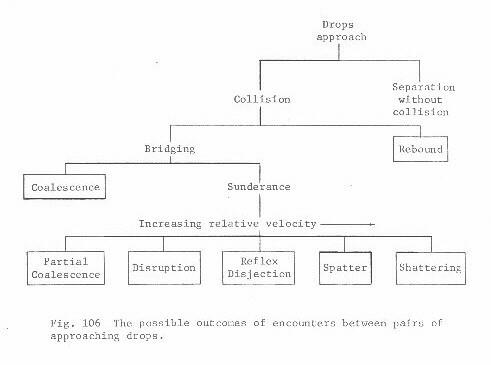 or drop size caused bridging to occur at a later stage of the collision while bridging was induced at a significantly earlier stage by a relatively small increase in the relative velocity. 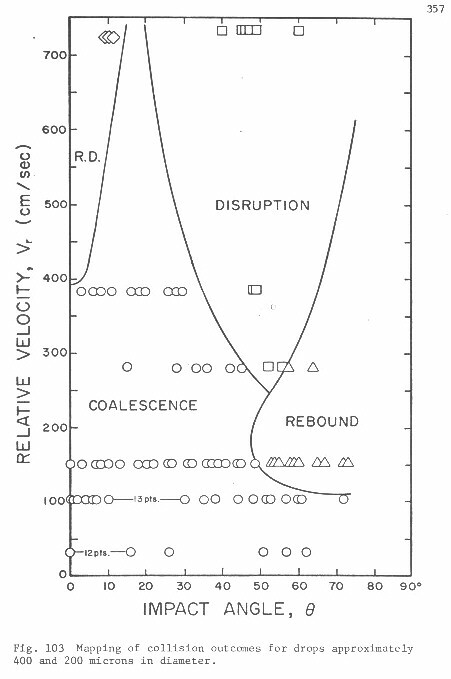 Early bridging was found in all but the least direct collisions at high relative velocities. In general, bridging seemed to occur at progressively later stages as the conditions which produced rebound were approached. Partial coalescence between dissimilarly sized drops was promoted by bridging at a late stage. rupture of an adsorbed film. The major deformation and long time of apparent contact found to be possible prior to or without the formation of a liquid bridge suggest that the impacting drop surfaces are separated by a tough, thin barrier which might consist of a film of adsorbed gas molecules. The sunderance of colliding water drops in the size range studied appears to be determined chiefly, if not entirely, by the four major factors. 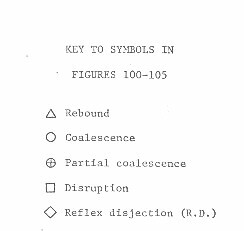 A simple model for a compound drop at the crucial stage which marks the turning point of a collision toward an outcome of coalescence or disruption has been found to give boundary curves in reasonably good agreement with the experimental curves for the coalescence-disruption transition. The results of the present investigation are believed to be more reliable than those of most previous experimental studies on the behavior of colliding drops because better control of both major and minor factors was maintained.